Our Queen is 85 years old, a woman who would never have been Queen had it not been for her errant uncle. She's lived through many turgid and troubling times, times of great social and economic change, of global warfare and, of course, her own family tragedies. She should have her feet up, drinking tea and nibbling biscuits, whilst watching the King's Speech but she's donned her best garb and flown to Southern Ireland to heal the wounds of the past. It must be arduous at her age yet somehow I think she looks genuinely pleased to be there. I have English, Irish, Welsh and Scottish blood in me. I've always thought of myself as British rather than English although I was born in England and live in England. I'm just glad and truly grateful, like the vast majority, there is peace with Ireland. 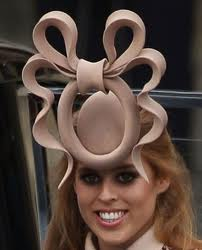 Thank God The Queen didn't send Princess Beatrice in that hat. There could be have been serious trouble. By the way the hat now £18,000 on Ebay if you fancy a gander - or alternatively wait for the hats I shall be offering for sale soon on my blog. They're almost as fetching as my cupcakes. In the meantime, someone take Philip Treacy to the The Tower. an Oxford Street Christmas decoration? What happens if you pull open the bow, I wonder? A rabbit pops out of her head? Was she never told the story of The Emperor's New Clothes? Ha, ha, ha PB that had me giggling! If only someone had the good sense to tell her beforehand how silly it is -I blame Philip Treacy - with all his years of experience he should have known better to dress her like that. I always thought you were mad! I laugh every time I see the picture of that hat. What WAS she thinking? At least she's had the good humour to realise that it could raise quite a bit for charity.